Soaring redwoods are the kings of some Western forests. Named for their reddish wood and bark, the tannins that give redwoods their hue also protect against most insects, which don't like its taste. The tannins also help protect the trees against fungi and fire. Three tree species are referred to as redwoods. The coast redwood (Sequoia sempervirens), hardy in U.S. Department of Agriculture plant hardiness zone 7 through 10a, are giants of the California coast, and some pockets of the trees can also be found along the coast of southern Oregon. The giant Sequoia (Sequoiadendron giganteum) grows in California's Sierra Nevada mountains and is hardy in USDA zones through 8. Both trees reach skyscraper heights of 300 feet or more with massive diameters of 20 to 25 feet. Some are more than 2,000 years old. The third kind of redwood is the dawn redwood (Metasequoia glyptostroboides), a native of northern China that grows in USDA zones 5 to 8. Much smaller than its California cousins, the dawn redwood grows 75 to 100 feet tall and, unlike the larger redwoods, is deciduous. Most insects find the taste of tannins bitter and steer clear of trees with high concentrations of this chemical. Tannins are also toxic to insects. They bind to proteins in an insect's saliva as well as digestive enzymes, inhibiting the its ability to digest plant proteins. Insects that ingest tannins can't gain weight, and some die. Older trees have more tannins than younger ones, as the compound accumulates over the centuries. Despite the fact that the trees aren't prone to much insect damage, some bugs can bother redwoods. Insects that can cause problems include two kinds of armored scales, the black araucaria scale and the redwood scale. Bark beetle pests include the cedar and cypress bark beetle and redwood bark beetle. In addition, the cypress tip miner and spruce spider mite can cause damage to redwoods. 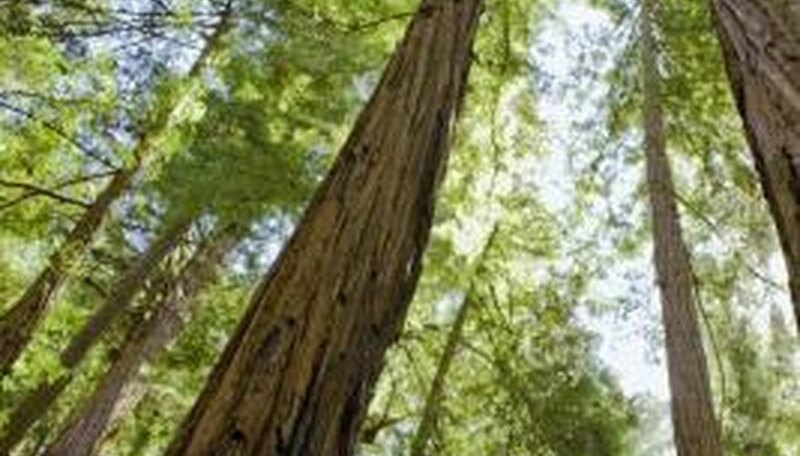 In addition to repelling insect pests, redwood trees are also naturally fire and fungi resistant. The trees' thick, moist bark often keeps the trunk from catching fire, while redwoods contain little flammable pitch, unlike fir and pine trees. Occasionally, fire will climb up the trunk of a redwood tree and burn the crown, while leaving the bark relatively unscathed. Fungi often take up home in the rotted areas of trees damaged by fire, but since redwoods are largely impervious to most fires, fungi usually never get a toehold.